The grandfather insists that Marcos (Julián Guzmán) address him as Señor Leon. Abuelo works as a janitor in a private school, where Marcos receives an academic scholarship to complete his final year of high school. In the school, he is bullied, and since Marcos has a temper, he immediately gets into trouble for fighting. However, with the help of a pretty student, her brother, the soccer coach, and another teacher, he learns to surmount all the challenges that come his way. And Marcos has many troubles. If there is any fault of the film, it is the telenovela style that heaps on one hardship after another. Besides the bullying, he gets into debt to the local mafia. He doesn’t own a cell phone and knows nothing about technology. Even a guy who tries to rob him complains that Marcos has nothing worth stealing. Marcos also discovers a family secret that almost ruins him. In the futbol side of the story, the high school competes in a tournament where scouts will select one player to train in Spain. Marcos gets ejected for fighting in the semi-final, and he has to wait for the 2nd leg of the final to prove his worth. This is a family friendly story that gently communicates values of education, perseverance in the face of adversity, teachers as mentors, temptations of drugs and alcohol, providing loving care for elders, and making something of one’s life. By the heartwarming end, Marcos has built a new foundation of friends, mentors, and remaining family. 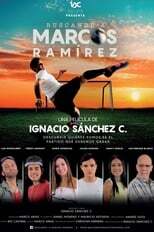 Buscando a Marcos Ramírez is the first feature film of Writer-Director Ignacio Sánchez Cantillano. Interviews of Sánchez show that he is very multi-faceted, having been a world traveler, a successful journalist, TV presenter, and TV director. He was also General Directorate of Traffic, where he implemented the mandatory seat belt law. How many film directors can say that? Many of the moral messages of the film appear to come from how he conducts his own life, such as listening to one’s inner voice and being true to oneself, and remembering from “The Little Prince” that “the essential is invisible to the eye”. Note that Sánchez plays the coach in the film. The soccer in the film is very authentic. 17 year old Julián Guzmán was discovered for this role, and was himself a player in the youth system of Club Sport Herediano. The games are played at Lincoln School. I caught this film on a United red eye flight from Peru, but you can rent it on vimeo. If this is what Costa Rican films are like, I hope we see many more. While all the performances in this film are excellent, I was particularly impressed with two supporting actors. Luis Montalbert, who plays Samir, is the bad guy drug dealer. Montalbert is lead vocalist of the alternative rock group Gandhi, and he wrote and sings the film’s theme song. Pedro Capmany plays Kenny, one of Samir’s homies, who changes his drug-fueled life because of Marcos’ goodness. A translation of the title is: Finding Marcos Ramírez. The title on the flight was Who is Marcos Ramírez.